Sensing hands and gestures with cameras has not been done a lot, and this is a great example. 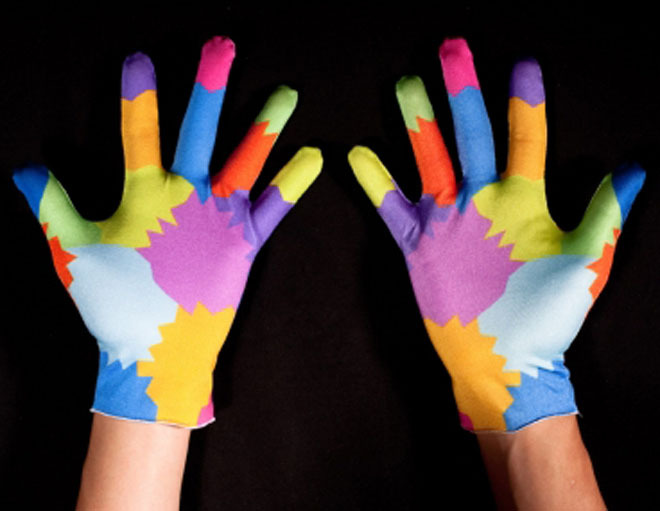 This is from two researchers at MIT using colorful, stretchy gloves and a webcam. The specifically colored patches on the gloves are recognized by the computer and the hands' positions and locations can be found. The gloves are designed to work effectively in different lighting conditions and show the front and back of the hand. Something innovative about this method is that the captured picture of the glove is compressed to a 40x40 pixel image and searched for a match in a database. The matched hand position is then used in the application. Since the position is not found by computing the relative position of the parts of the hand, this method can be very fast and efficient.